So you think you’re an expert at shipping in the Mediterranean do you? Have you ever purchased your wares in Alexandria, sailed through pirate infested waters, and haggled your goods for a profit in Carthage? Probably? 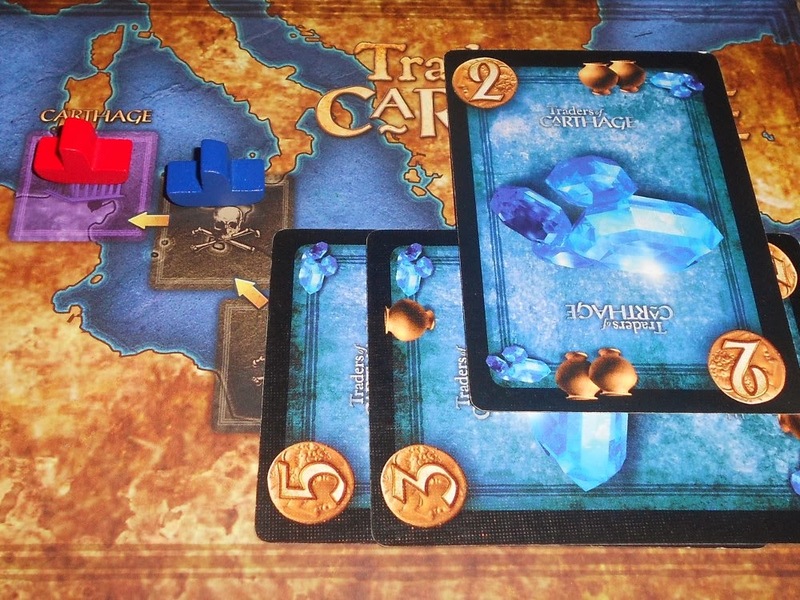 Luckily the theme doesn’t try too hard in Traders of Carthage and there’s a really good game buried under the surface. 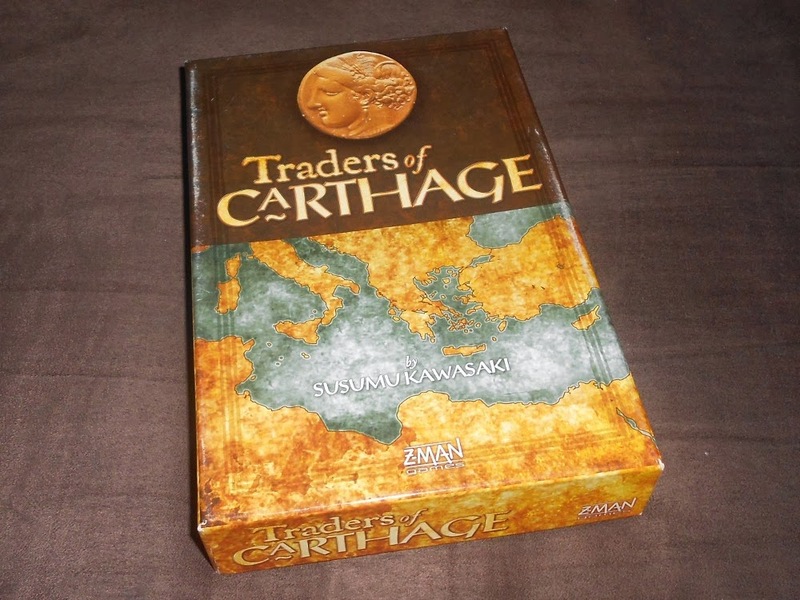 Traders of Carthage is a hand management card game which has the players take on the role of traders selling their goods to merchants in the city of Carthage. During the game you will be buying goods of the four different colors from a Market which will show those available for purchase. Above the Market is the Farm where cards are shown that will eventually come to the Market but aren’t available for purchase yet. This gives players an idea of what goods will be available in the future. Next to the Market and Farm there is a board showing the route between Alexandria and Carthage where ships of these four colors will be sailing, seeking to deliver your goods to Carthage. Each card has a type indicated by the color and large symbol in the middle, a currency value, and storage icons indicated by a number of vases. Cards with lower currency values have more storage. At the beginning of the game all players are dealt cards from the deck until they have a total currency of 8 or more. The player who received the smallest value becomes the start player. Players also start the game with an Achievement token of their choice, these allow them to get more value when delivering goods of the matching type. During the game players take turns in clockwise order having one of three available actions to take on their turn. The simplest option is to take a card from the Market and add that card to your hand for use as money or storage (protection from pirates). A more lucrative option is to buy out the Market, adding all the cards to your Merchandise area forming sets of goods with matching colors. You must pay for this purchase by discarding cards from your hand with a total currency equal to or greater than these goods. When the Market is purchased the ships move towards Carthage fueled by your buying rampage. If their type of good was in the Market then ships will either move one space if one good was purchased or two spaces if two or more were purchased. The Market is then refilled by moving the cards from the Farm along with two cards from the draw pile. The Farm is also replenished with three cards from the draw pile to show what’s currently being produced. The Market can also be refilled if there are no cards available in the Market at the beginning of a player’s turn. 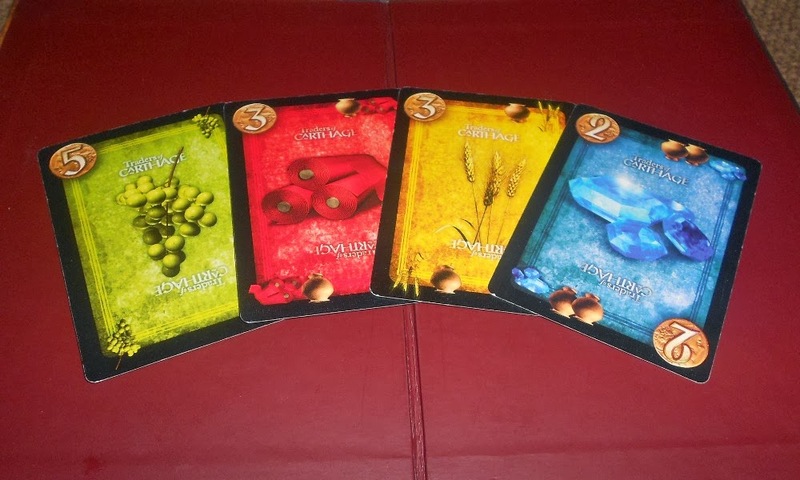 The last option a player has on their turn is to reserve a card from the Market or Farm by placing their reservation token on that card and saying “mine”. You can only do this if you have your reservation token available and may only reserve cards that have not already been reserved by another player. After a card has been reserved it is only available to the owning player. When buying goods from the Market, a player must buy all the goods that they can which includes their reserved card but not cards reserved by the other players. If at least one ship reaches Carthage after they move then a Payday is triggered! 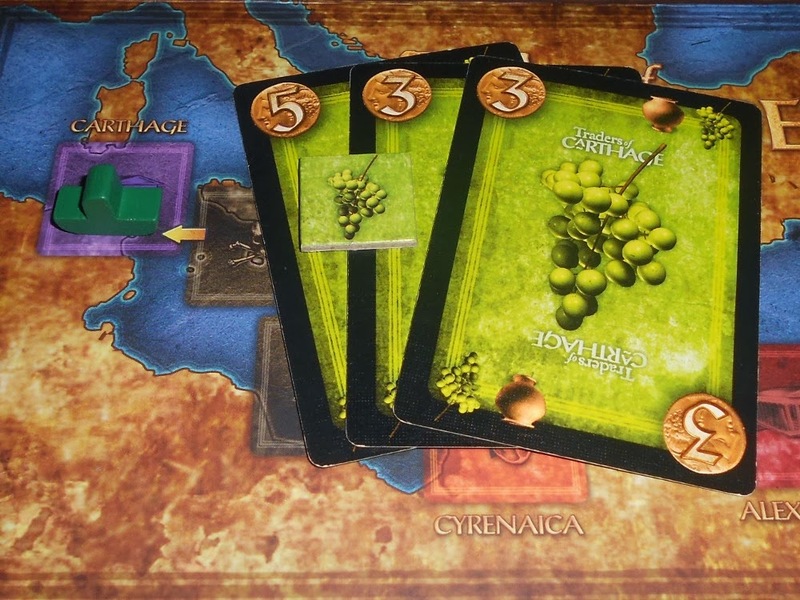 All players greedily deliver their goods matching the ships that arrived in Carthage. Since trading is apparently really complicated you now have to calculate the Price by looking at the highest value card in the color set and then multiply that amount by the number of cards in the set. Almost done, now round up to the nearest multiple of 5 (for example, a total of 9 would round to 10). Finally take one card from the set for every 5 points and place them under your Trader piece to indicate your Victory Points from that transaction and discard the remaining cards. If any points are gained this way then the player also receives an Achievement token of the matching type. Great Job, you’re now better at haggling a good price on those goods! These tokens will increase the Price of any future deliveries of that type by 1 each. All ships that made it to Carthage are then magically transported back to Alexandria to make the trek again. But beware, pirates roam the waters around Carthage and will raid the ships that are on route (spaces marked by a skull) when a delivery is made. All players are affected by these raids and must immediately protect their goods being raided or lose them to the pirates (discard pile). In order to protect goods a player can discard any number of cards from their hand of the matching color with storage icons to save one card per icon. Protected cards are turned sideways to indicate that they are safe from future raids. All ships that were raided are moved back to Cyrenaica to recover before attempting the dangerous voyage to Carthage once more. The blue ship was raided! Protect that precious cargo by discarding a card with 2 vases. 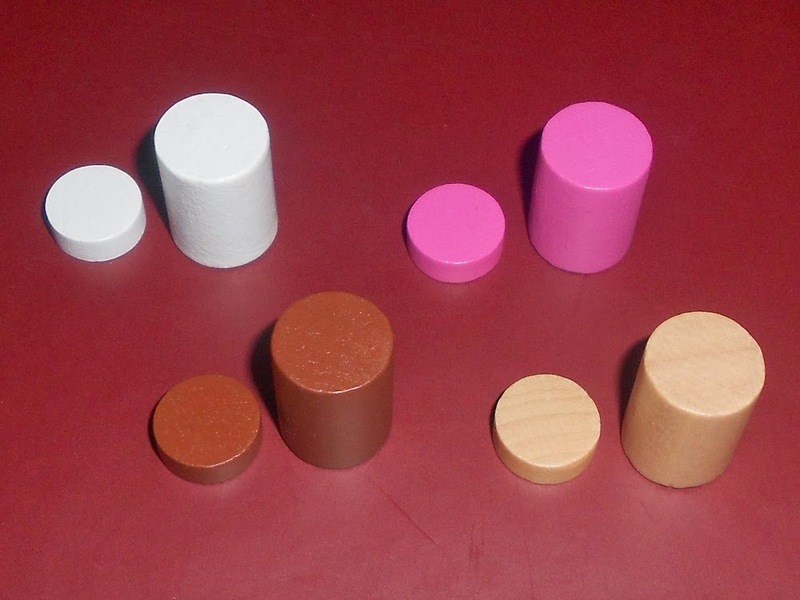 The game ends after the delivery phase when any player has acquired 8 or more Achievement tokens. 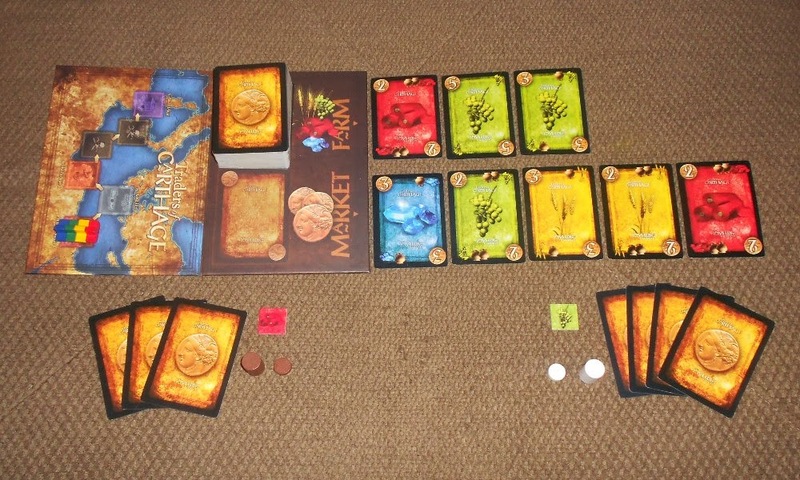 Players count the number of cards they have under their Trader token (Victory Points) and the player with the most points wins and is crowned King of the Traders. Trade Up or Ship Out? I’ll get the obvious nitpick of the theme out of the way right off the bat. While I don’t mind trading in the Mediterranean as a subject, in this case it doesn’t even tie very closely with the actual mechanics in the game. Sure, you’re buying goods from a market and then delivering them when boats carrying that type of good arrive in Carthage but it doesn’t really make sense exactly how your buying is fueling the boats or how they even get the cargo on board. Also goods from the “Farm” moving to the Market makes some sense but considering the type of goods available even that seems like a bit of a stretch. If you try to rely too heavily on the theme while teaching the game then you may end up confusing people so it’s better to just get right into the game and leave the theme behind. Now, I’m not the type of gamer to get hung up on weak thematic integration so it doesn’t really bother me and I’ll move on to looking at how the game plays. Traders of Carthage is an extremely tactical game and the nature of the game actually changes quite a bit between 2 players and 3-4 players. Regardless of player count you are constantly having to make immediate decisions without being able to plan very far ahead because of the limited knowledge of available goods and what the other players will do. The Farm does give you a glimpse into what goods will become available once the Market empties out but two other cards are drawn as well when the Farm is moved down so even this doesn’t represent perfect information. Almost everything in the game is subject to change between your turns: the availability of cards in the Farm and Market, the total value of the Market, and the position of the ships are all available for manipulation by the other players. Even the goods that you have purchased as Merchandise are able to get raided. This isn’t to say that you have no control over what’s going on but the more players in the game, the less control you do have over these different factors. Having a higher player count encourages speculation and collusion whereas playing with just two gives the players a better ability to manipulate the various elements. I personally think that the game really shines with two players as I’ve found that having more control over manipulating the game leads to great tension without leaving you feeling totally helpless. However, with all player counts the limited options available and the tactical nature of the game keeps things moving along at a quick pace. The four goods: Fruit, Fabric, Wheat, and Gems? Since there is such a strong emphasis on manipulating the game to give you an advantage there is a strong sense of interaction even if it may come across as indirect at times. The most obvious direct interaction is in the pirate raids. By buying the Market at the right time you can ensure that ships carrying your goods get to Carthage while those that your opponents have invested in get raided. Although this may seem direct it is actually the result of manipulation of the Market and goods speculation, the two mechanic that drive the interaction. You are collecting goods with a very limited information about what will become available so relying too heavily on this would be somewhat shortsighted. Luckily you can take cards from an expensive Market before it can be purchased, affecting which goods can be purchased and how the ships will move when another player buys it out. More importantly you are able to reserve cards which can be used to both ensure the goods you want become available or prevent your opponents’ goods from showing up. Reservation itself can be used as a stalling tactic of sorts, allowing you to leave the Market unaffected for a turn if the need arises. The thing that makes this system work so well is that the cards have multiple uses: Currency, Storage, and Goods. This gives you more choices when determining what to take or reserve from the available cards or whether to just buy the Market. You can take a big card that you don’t want your opponent to buy for his long set and use it as currency or instead reserve it to make sure you complete your own. On the other hand, a cheap card that could easily be purchased can be taken to use for protection from pirates or reserved to help you move your ships more quickly. This mechanic is used nicely to ensure a variety of good options through the game. Goods speculation is more important with a larger player count since you have less control over the movement of the ships. It’s impossible to get a ship to the point where it can reach Carthage when the Market is purchased without first entering dangerous waters. This means that you are almost always subject to be raided and have to decide whether to save your cards to be used for protection or spend them to buy a lucrative Market. This leads to a tense risk/reward system where players must evaluate the worth of the Market based both on the goods available and board position that will result from its purchase. There is thus an emphasis on both timing and hand management throughout the game. The number of cards in your hand is open information so you should only empty out your hand when you can get a good pay off because it gives the other players a big advantage. Playing with more players has different results on this so while playing risky with the full player count may pay off if another player can also benefit from your maneuvering it will only work with 2 players if you can continue to control the board to your advantage. The Achievement tokens act both as a natural game timer and an incentive for players to value some goods higher than others. Having a token right from the beginning of the game gives players an extra bit of direction but doesn’t necessarily force you into pursuing that good exclusively. I think it’s a pretty elegant mechanic in how it forces players to pay attention to yet another factor when evaluating their position without bogging down the game. I will concede that the scoring system is a bit counter intuitive to explain. Since I like math I find it very easy to grasp but I sometimes have a difficult time explaining it to new players. I’ve heard it explained pretty well a number of times but it’s a somewhat odd system. Even though I find it somewhat charming I could see how another system could simplify and speed up the scoring process. The odd player color choices, some pretty exciting options here! 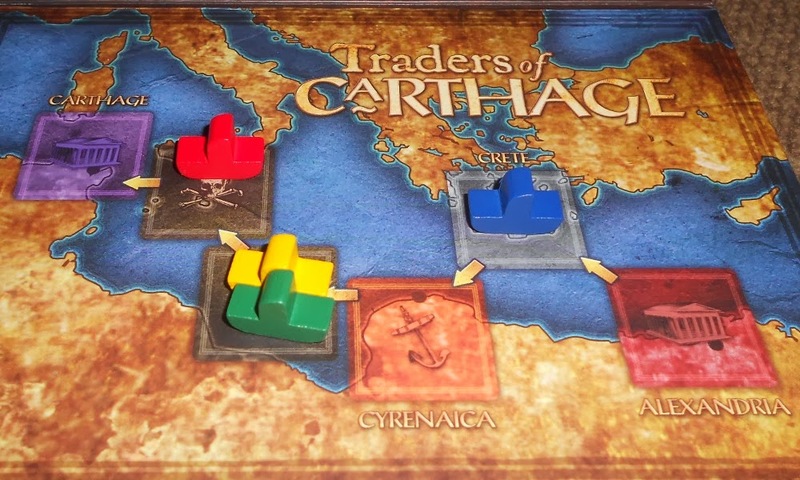 Traders of Carthage is a very tactical game that challenges players to manipulate the board better than their opponents. This leads to a tense game from a somewhat dry and loose theme. I’d recommend it highly as a 2-player game to anyone that likes a quick and clever game which packs a lot of meaningful decisions into a small package. Next Article Review: Get Bit!